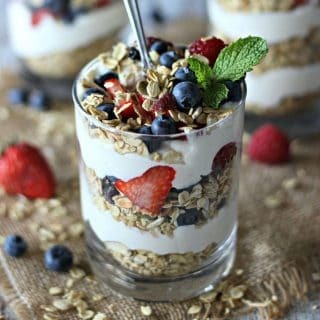 These Greek Yogurt Cheesecake Parfaits make a lovely healthy breakfast, and can even be prepared ahead of time. Made with fresh berries, a Greek yogurt cheesecake filling, and delicious layers of new Nature Valley Muesli, these are hard to pass up! Happy Thursday, y’all! To celebrate the fact that we are more than halfway through the week, I’ve brought you a healthy and yummy breakfast/dessert recipe today. YES that’s right; breakfast OR dessert! These Greek yogurt cheesecake parfaits are a great summer time treat when the weather is hot and you aren’t looking for anything too heavy. My sweet tooth knows no seasons, but sometimes in the summer I like to lighten it up and stick with recipes that are a little more fresh and healthy. I’ve been trying to make more healthful choices in what we eat. 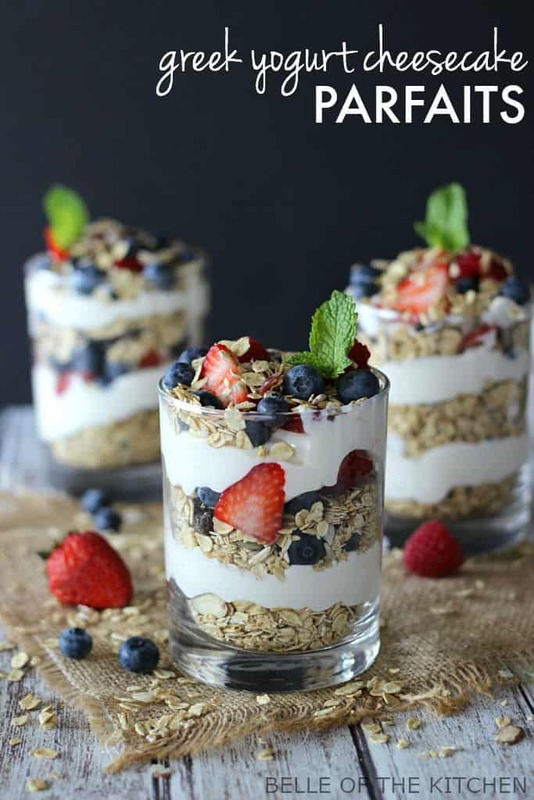 I’ve found that if I can still satisfy my sweet tooth while eating something healthy (like these parfaits made with greek yogurt and Nature Valley Muesli), then I’m much more likely to succeed in eating healthfully throughout the rest of the day. These parfaits are full of berries and a cheesecake filling made from Greek yogurt and light cream cheese. Then they are stacked with delicious layers of Nature Valley Muesli for a chewy, nutty finish. 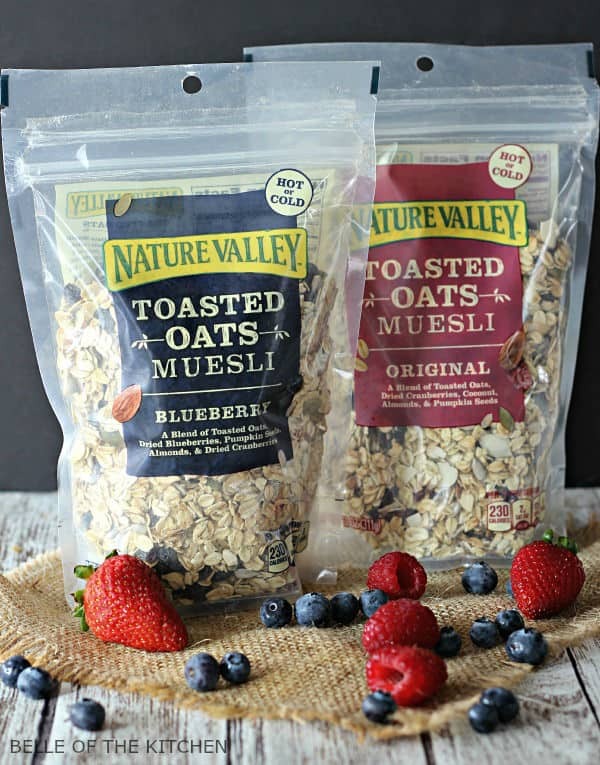 Have you tried the new Muesli from Nature Valley yet? If you’ve never had #muesli before, it’s a delicious blend of whole rolled oats, fruit, nuts, and seeds. It’s lightly sweetened and made with lots of wholesome ingredients you can feel good about eating. I was recently able to sample both the new Nature Valley Toasted Oats Muesli-Blueberry and Nature Valley Toasted Oats Muesli-Original. I really enjoyed them, and both tasted equally delicious in these parfaits. The Original has a nice hint of coconut flavor which I really enjoyed, and the Blueberry is full of yummy dried blueberries and cranberries. I love that you can sprinkle it right on your yogurt, or eat it by the handful like you would with granola. PLUS you can combine it with a little warm water or milk and turn it into oatmeal! I love how versatile it is like that. Both flavors are now available in major retailers and grocery stores across the country, so be sure to check it out! Now these parfaits may look fancy, but they are super easy to make and can even be prepared ahead of time. If preparing in advance, I would simply create the layers of fruit and cheesecake filling, then leave space for the #muesli on top. Refrigerate until ready to eat, then add on the muesli. Preparing it this way prevents the muesli from getting soggy overnight. These can also be made in mason jars and topped with a lid to take with you for an easy on-the-go breakfast! To make your parfaits, all you need to do is mix up some softened light cream cheese, 2 cups of greek yogurt, and 1 package of sugar-free cheesecake pudding mix with an electric mixer. Grab some juice glasses (or small mason jars, stemless wine glasses…whatever you’ve got) and start by placing a layer of #muesli in the bottom. Top with a layer of cheesecake filling, then a layer of fruit. Repeat the layers, then sprinkle with a little bit more Muesli on top and you are DONE! 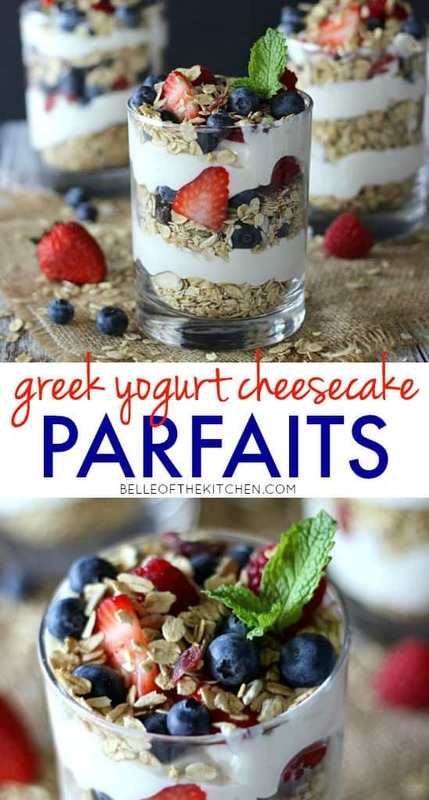 These Greek Yogurt Cheesecake Parfaits make a lovely healthy breakfast, and can even be prepared ahead of time. 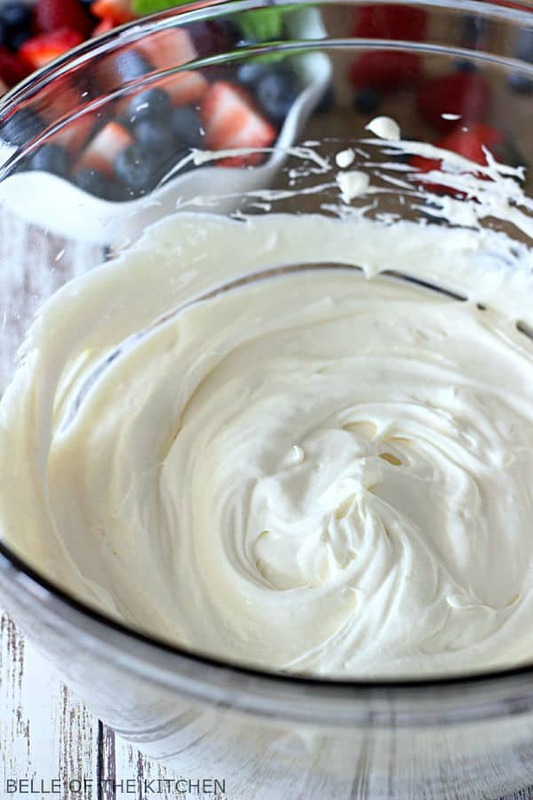 In a medium sized bowl, mix together Greek yogurt, cream cheese, and pudding mix with an electric mixer until smooth. 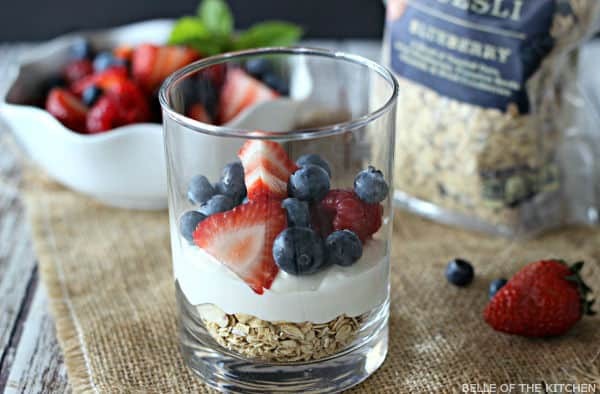 Begin layering parfaits in short glasses or mason jars. Begin with a layer of Muesli (about a 1/4 cup), followed by a layer of cheesecake filling (about 1/3 cup), and then a layer of berries. Repeat layers, finishing with berries and Muesli on top. That granola looks delicious! And these parfaits…..WOW!!! What a gorgeous treat!! These look so delicious! Thanks Michelle! These were so fun to make! I have been dying to try muesli and I had no idea nature valley made it! I love their stuff so I know what I am making next week for dessert! Your pictures are absolutely beautiful, this looks like a fun breakfast for 4th of July! Oooo I love that idea, Sara! Thank you! Hey, Ashlyn, these look COMPLETELY Yummy! I’m always looking for ways to use more Greek yogurt, and this is perfect. I think you could probably use Neufchatel cheese in this, too. Can’t wait to try it! Hi Kathy! YES Neufchatel would work wonderfully as well! Hope you enjoy these! I’m just getting back from the gym and naturally I want ice cream.. but one of these parfaits would be a much healthier choice! YUM! THOSE LAYERS! 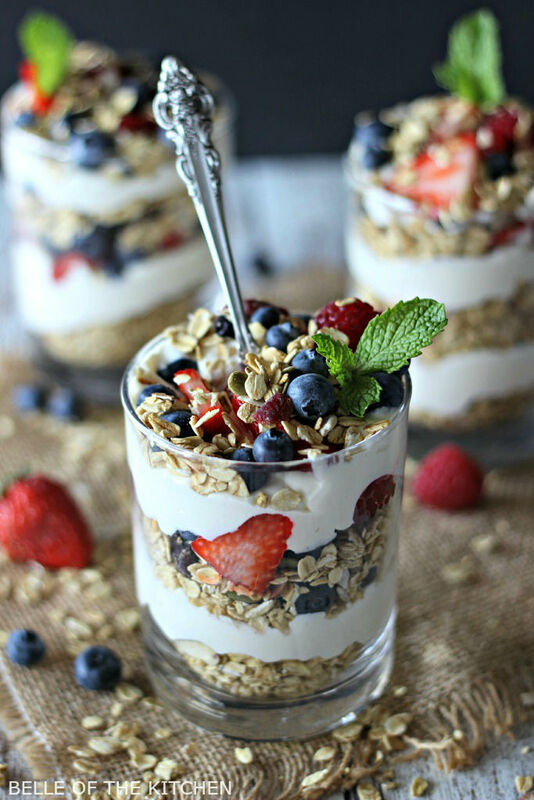 These parfaits are stunning! Pinned! Beautiful! 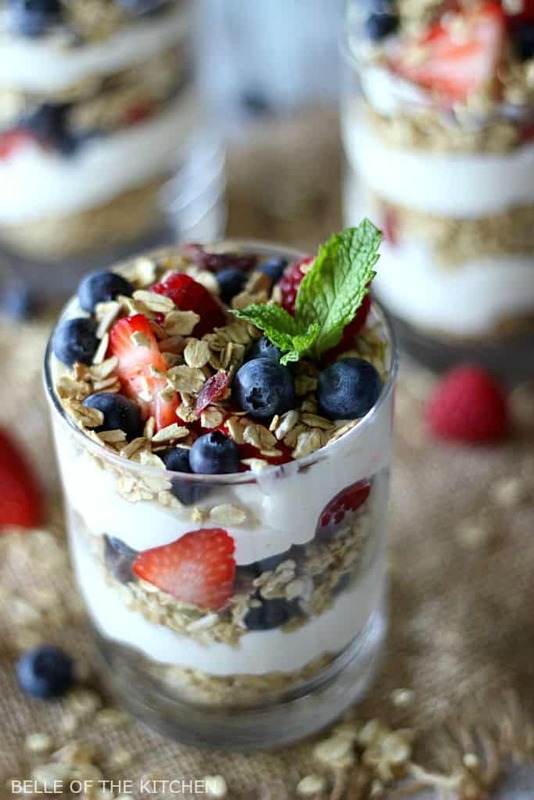 I love parfaits and these look splendid. Thank you for sharing!